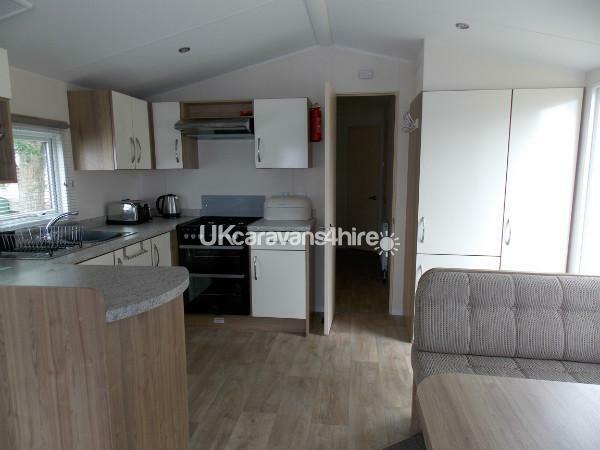 Our stylish caravan was sited when brand new in July 2014 on the fantastic Butlins resort at Minehead in Somerset. 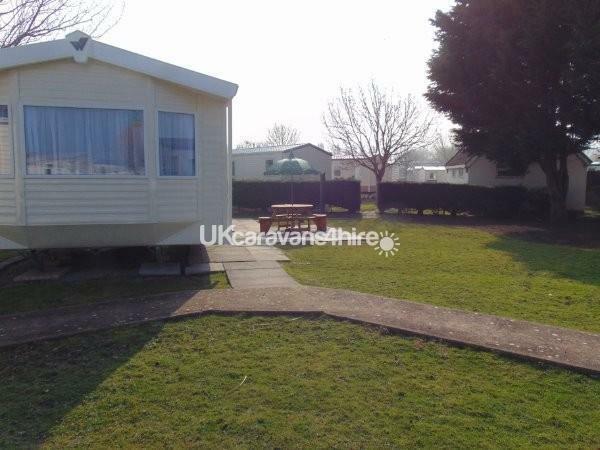 Located at Number 147 Viking Cove on the Lakeside Caravan Park within Butlins. It is ideally sited away from the lake and the road so it\'s perfect especially if you have children in your party. 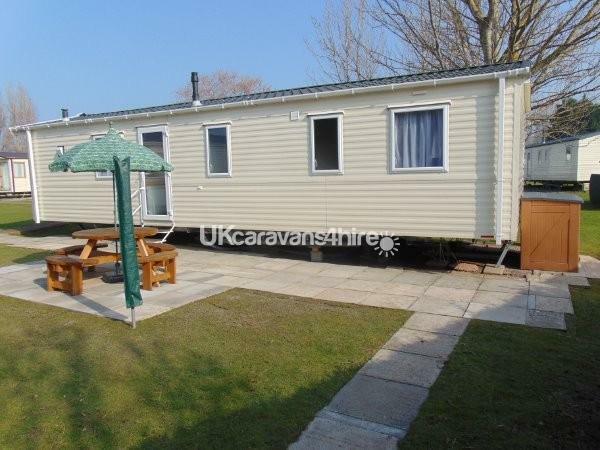 The caravan is an 8-berth Willerby Rio Gold 35\' x 12\'. It has central heating throughout and constant hot water on demand from a combi boiler. It is also double glazed throughout. It has one double bedroom and two twin bedrooms, all of which have ample storage space to hold your holiday belongings (the double bedroom even has lift-up underbed storage which is great to hide away your suitcases, etc). There is a pull-out double bed in the lounge. 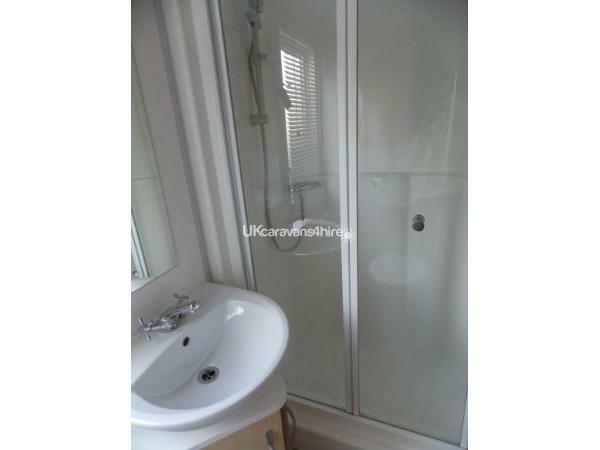 It has a shower room with toilet and wash hand basin, and an additional toilet with wash hand basin. 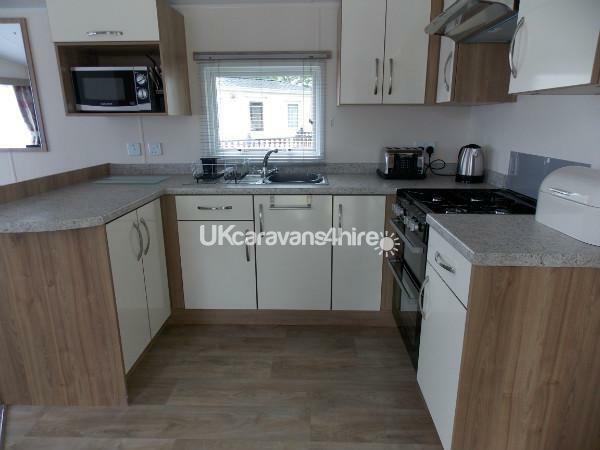 The kitchen is fully equipped and has a gas oven and hob, microwave, kettle, toaster and a full size fridge freezer. There is plenty of seating in the lounge area which also has a dining table with sofa-style seating and stools. Also in the lounge there is a gas fire, 32\" flat screen TV and DVD player. 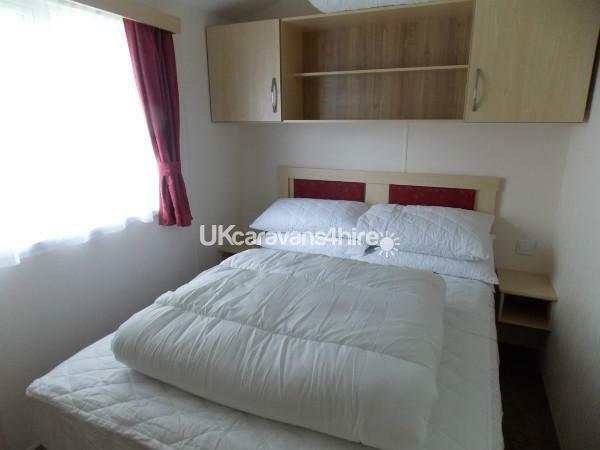 The caravan is located on a good plot on Butlins Minehead, away from the road and the lake, and overlooking a good sized grass area. There is a private patio area with a large round picnic table and seating for 8 people. There is also a lockable outside store which is handy for storing your beach equipment, pushchairs, children\'s scooters, etc. The allocated car parking space is near to the caravan, so not too far to carry your luggage. We provide excellent quality pillows and pillow protectors, quilts and waterproof mattress protectors, and beds will be made up with fresh linen ready for your arrival (please note that although a travel cot is provided you will need to bring your own cot linen). Please also bring your own towels and tea-towels. 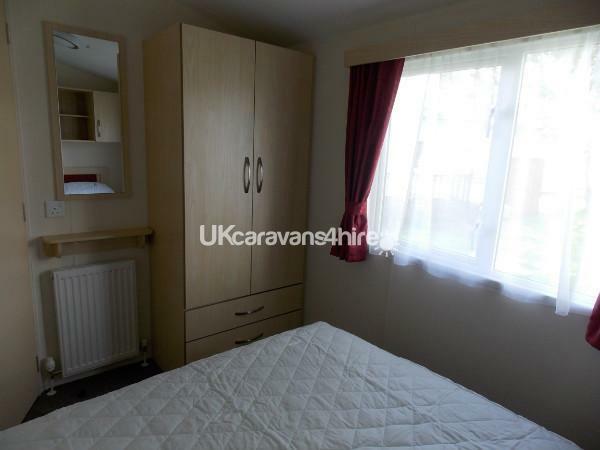 There is an iron and ironing board in the caravan, together with a clothes airer and an outdoor rotary airer. We also provide a Travel Cot, Highchair and Bedguard, and there are plentiful plastic cups, plates and bowls too for your little one - so just a few things less to pack. Mains gas, electricity and water are all included in the price of the caravan hire. You are welcome to fish the on-site fishing lake which is free to use for caravan guests, no licence needed. The fabulous Butlins entertainment and leisure facilities are also included in the price of your holiday (with the exception of some private ticket events which are detailed on our pricing page). 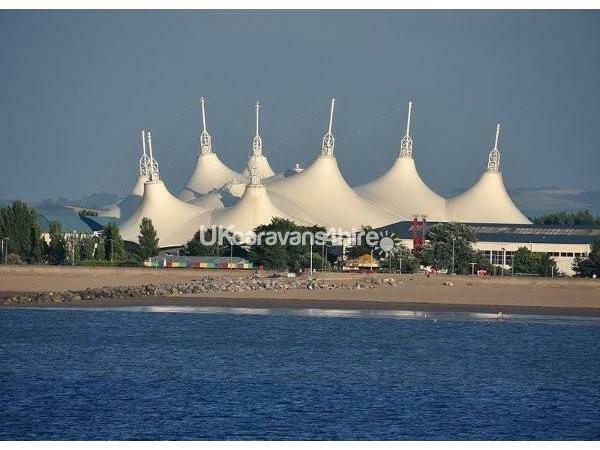 Have a look at the Butlins website to see everything on resort. The lovely sandy beach is opposite Butlins just a short walk away from the site, and the pretty Minehead town centre is also within walking distance. If you fancy a longer stroll, head along the promenade to the Harbour. Please visit our website www.caravanhirebutlinsminehead.co.uk for lots more information about our 3 caravans, bookings, Butlins, and the surrounding area. We hope to speak with you soon! WE ALSO HAVE 2 OTHER CARAVANS ON THIS SITE - PLEASE SEE ADVERT ID2757 and ID3507. 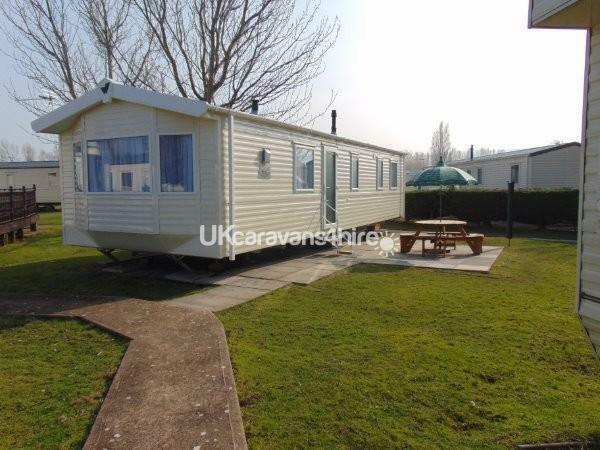 The caravans are adjacent to each other so great if you\'re holidaying with a larger party and need the extra space. Additional Info: Splash Waterworld, Traditional Fairground, Tots Indoor Funfair, Soft Play Area, Outdoor Playgrounds, Meet and Greet Characters and Shows, Daytime and Evening Shows in great venues catering for both children and adults. I stayed as part of a family group including some young children at 607 and also 2757 and 3507 all owned by Dawn. Dawn was extremely friendly and helpful during and after the booking process and nothing was too much trouble. The caravans are extremely well equipped with much thought having gone into the equipment and storage requirements whilst on holiday. All 3 caravans are well maintained and are well presented. I have booked one of the caravans again for next year and would highly recommend. We have stayed in this same caravan twice now, we have been very happy with it both times and would not hesitate to stay again! Above all, Dawn is great with her communication and very accommodating. All facilities in the caravan that you could wish for with little ones, the little details have made it home from home for us! 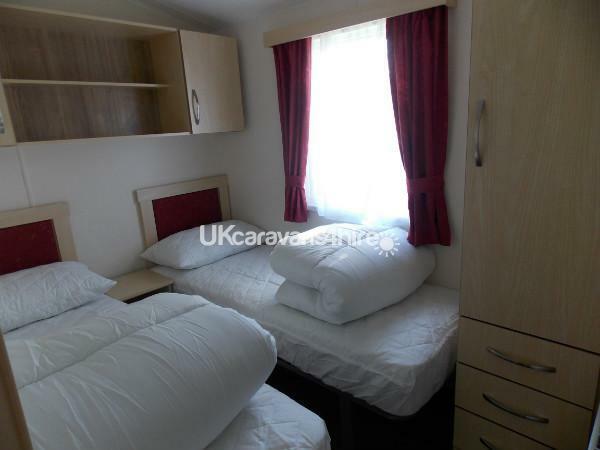 The caravan is in a great location with ample to do on site.